Caring for your bamboo sheets can be a big task. Given the different types of bamboo fiber that the sheets can be made from, each actually requires a different care level. Unlike cotton sheets or microfiber, bamboo sheets are typically far more delicate. If you do not care for them properly, you may be forced to replace them, which is rarely cheap. Here, we will cover how to care, wash, and maintain your bamboo sheets so that they are sure to last a while. Bamboo sheets come in more than just one variety. There are actually three different types, along with a blended option which combines bamboo with one of the other more common fabrics like cotton or microfiber. Each type of bamboo has a very different manufacturing process, which results in either a softer and durable fiber, or a more delicate fiber. Bamboo rayon is regenerated cellulose fiber. Often called bamboo viscose, it makes up the majority of bamboo fabrics and is one of the best bamboo sheets on the market today. Most rayon viscose is made using the viscose process. This involves dissolving the bamboo cellulose in a strong solvent. This creates a pulpy solution that's forced through a spinneret and into another solvent that solidifies the cellulose strands into the fibers. These will then be used to make the thread, and ultimately the rayon. Some of the chemicals used in the process of rayon include chlorine bleach, sodium hydroxide, sulfuric acid, and carbon disulfide. Due to this, the rayon tends to not retain much of the original bamboo. In fact, bamboo rayon sheets are required to be labeled as Rayon made from bamboo. This is because in 2009, the FTC (Federal Trade Commission) found that rayon made from bamboo really does not retain any of the antimicrobial properties of the bamboo plant. In addition, its manufacture is absolutely not eco-friendly, as the process results in a lot of waste water, along with harsh and toxic chemicals. Bamboo linen, also known as either natural bamboo or 100% bamboo, is manufactured in the same way as is used to make linen from flax or hemp. The woody parts of the bamboo are crushed, and natural enzymes are added to break down the bamboo and turn it into a big mound of mush. The fibers are then picked out mechanically, rather than chemically. These fabrics are 100% eco-friendly, as they do not involve any toxic chemicals being used. The only byproduct there would be is carbon dioxide from the running of the machines. Bamboo lyocell is made roughly in the same way as rayon, but using less toxic chemicals. These chemicals include hydrogen peroxide and a type of weak alkalines known as amine oxides. Lyocell is manufactured in a closed-loop process. This means that the chemicals used are continuously recycled back into the process, keeping them out of the environment. It also requires less water to manufacture. Lyocell also tends to retain more of the beneficial properties of bamboo than rayon does, but not as much as Bamboo linen. As I stated before, bamboo requires a bit more care than other fabrics. The fibers are rather fragile, can wrinkle easily, and can shrink if you are not careful. So here are some things you should keep in mind to care for bamboo sheets. Brand new bamboo sheets are typically over-sized when you first take them out of the bag. This is to allow for a small amount of shrinking so they have the best fit for your bed. However, many people are not aware of this and place them on the bed as soon as they receive them. Be sure to pre-wash them before putting them on. Otherwise, you may be slightly disappointed for no real reason. In addition, the washing requirements are different for each bed set. Depending on the type of bamboo sheets you have, the care level will be higher or lower. 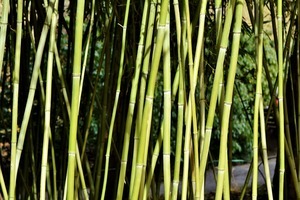 For the most part, viscose from bamboo has a relatively low level of care and are able to be machine washed and dried. I will go more into detail about the washing requirements soon. If you are curious about how to dry bamboo sheets, the answer is quite simple. For the most part, viscose from bamboo can be machine dried. However, even viscose requires a very low heat, like a tumble dry. Many sellers will recommend that you line dry bamboo sheets. This is because the bamboo fibers can be damaged by high levels of heat. This can cause the sheets to rip, shrink, or lose their softness. In addition, bamboo sheets have a wrinkle problem. Therefore, if you end up leaving them in the dryer for too long after the cycle is done, you may end up with very wrinkled sheets. Every seller recommends that you remove the sheets immediately after the drying cycle is done to avoid any excessive wrinkling. So if you have made that mistake and are wondering how to get wrinkles out of sheets in the dryer, now you know. Storing bamboo sheets is another issue. As I said before, these sheets have a real issue with wrinkling. While leaving them in the dryer for too long will result in them wrinkling, storing them improperly will also result in the same. But it is more than that. Because the sheets are naturally moisture wicking, storing them in a plastic container can cause the sheets to develop mildew and the sheets yellowing. To avoid this, many sellers will send give you the sheets in a breathable bag. This is more than just a nice gift bag, typically it is also a way to safely store your sheets. Sometimes it is even made from another bamboo fiber, which is really cool. Something else to keep in mind is that, like drying your sheets, you should not store your bamboo sheets in an area with a lot of heat. Basically, keep your bedding away from heaters, radiators, vents, and direct sunlight and cupboards. It is best to store your bamboo sheets in an open, dry, and cool place. It actually may be best to simply put them back on your bed after you wash them. Okay, so here is the part that can get a bit tricky. Depending on the type of fiber and the recommendation from the seller, the washing and drying requirements may be a bit different. Linen especially requires a higher level of care than Viscose from bamboo. What this may entail is a more delicate wash. Linen most importantly and most commonly requires that you hand wash them with a neutral pH soap created for delicate fabrics. 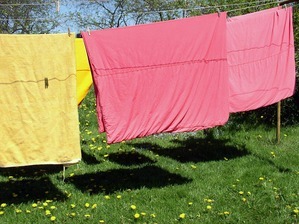 Then for drying, you will need to air dry them by hanging them on a line during the day. When it comes to Bamboo Lyocell and Viscose, the washing requirements are usually the same, but the drying needs may differ from seller to seller. For the actual washing, the general requirements are to wash the bamboo sheets in cold or cool water. Avoid using warm and hot water as it can damage the bamboo fibers. In terms of detergent, use a mild, liquid detergent. If you have a biodegradable detergent or can find one, it is even better to use that. Do not use bleach or any harsh detergents, as the chemicals can severely damage the bamboo fibers. If your sheets are stained, it is best to pre-soak with a stain remover before washing. Not only is it a gentle way of removing stains and marks, but it also brightens your sheets. In addition, fabric softener is not needed, as they are already very soft. Also be aware that bamboo generally comes out of the washer feeling stiff and canvas-like. This is normal, so do not worry by thinking you have harmed your sheets. In addition to those general steps to take when caring for your bamboo sheets, there are also some other things that you should keep in the back of your mind. While bamboo sheets are resistant to pilling, it can still happen. The best way to avoid this is to wash them separate from other items like blankets and towels. Towels especially produce a lot of lint, which can stick to sheets and create friction, which of course causes the pilling. If your sheets tend to become wrinkled, you can iron them without worry. Simply use a low heat and avoid using steam. Due to the moisture wicking nature of bamboo sheets, the hot steam can actually be absorbed into the sheets and cause some damage. It is best to use an electric iron and set it to low, so you do can get rid of those pesky wrinkles without any damage coming to your sheets. Like I said before, your sheets may feel stiff after you wash them. This totally normal for bamboo and does not mean that they are damaged in any way. If you choose to line dry your sheets, which is the best choice, you can throw them in the dryer fro a tumble dry for a few minutes. This will safely get rid of any stiffness you may encounter. In addition, if you are unable to get your sheets out of the dryer immediately after the cycle is done and want to avoid them wrinkling. You can just fluff them in the dryer for 10 more minutes on a high heat. This will get rid of the wrinkles, but it is still best to remove right after the cycle is done. It is probably best to know when you should wash your bamboo sheets. Unless they are incredibly dirty and/or something has spilled on them, you should wash them every two weeks. However, this can change from season to season. In the summer, when it is really warm and you tend to sweat more often, it is best to wash your sheets every seven to ten days. In the winter, you can wash them every two weeks. Many people are probably unaware of the level of care that bamboo sheets require. While other bedding fabrics are rather easy to care for, the nature of bamboo requires a bit more attention and TLC. But, it is not something that will take up your entire day. Most likely, you will just have to pay attention to when the drying cycle is done, or if you are gone for the day most of the time, just hang them up outside after the wash cycle is done and take them in at the end of the day. Due to the cost of bamboo sheets, taking good care of them is very important, unless you want to buy a whole new set of sheets. To ensure that you are getting the most out of your brand new bamboo sheets, follow the care recommendations that the seller provides. If there are none, that is what this article is for. Bamboo bedding can be highly beneficial and can last you a long time, if properly cared for. For more information, head on back to Green and Growing.